The Marshall Tucker Band with Crawford & Power will be playing Carolina Theatre in Durham, NC Friday, May 3. Today, the band records on its own RAMBLIN’ RECORDS Label (distributed by Sony/RED) and continues to release new and previously unreleased material. Still led today by Gray, they represent a time and place in music that will never be duplicated. Gray is quick to credit the band’s current, dynamic members with carrying on the timeless essence of The Marshall Tucker Band sound. Current members include the highly respected drummer B.B. Borden, a former member of both Mother’s Finest and The Outlaws, multi-instrumentalist Marcus Henderson, who plays flute, saxophone, and keyboards in addition to lead and background vocals, Pat Elwood on bass guitar, and Rick Willis on lead guitar and vocals. Acclaimed lead guitarist and vocalist Chris Hicks recently rejoined the band after a two-year absence. Together, they present a powerful stage presence as they continue to tour the country and be a force in the world of music. These Southern rock icons will perform at the Carolina Theatre of Durham on Friday, May 3. The Marshall Tucker Band got its start in Spartanburg, SC when Gray teamed up with Tommy Caldwell and Toy Caldwell, Paul T. Riddle, George McCorkle, and Jerry Eubanks, borrowing the name “Marshall Tucker” from a piano tuner whose name was found on a key ring in their old rehearsal space. In 1972, they signed with Capricorn Records, the same label that guided The Allman Brothers Band, Wet Willie, and others to national fame. The MTB opened shows for The Allman Brothers in 1973, and the following year, they began to headline their own shows across America due to the platinum-plus sales of their debut albums. They toured constantly, playing sheds, stadiums, theaters, fairs, and festivals. In years to come, The Marshall Tucker Band would wow critics and influence major country acts like Alabama, The Kentucky Headhunters, Confederate Railroad, and Travis Tritt with its definitive blend of rock, rhythm & blues, jazz, country, and gospel. Now, thanks to the expanding scope of today’s music, a new generation of fans is learning what the rest of their fans have known for so long – that good music knows no boundaries. Along the way, the band has recorded 22 studio albums, three DVDs, three live albums, and many compilations. In 1980, Tommy Caldwell died as a result of injuries from an auto accident. In 1984, Toy Caldwell, George McCorkle, and Paul Riddle decided to retire. Doug Gray and Jerry Eubanks – with the blessings of the other three – continued to record and perform as The Marshall Tucker Band. In 1993, Toy Caldwell, who wrote the majority of their songs, passed away, as did George McCorkle in 2007. Jerry Eubanks retired in 1996. Doug Gray continues to lead the current band of fine musicians, winning new young fans and satisfying the loyal fans of several generations. Years of rigorous tour schedules earned the band the respect of critics and countless dedicated fans. With hit singles like “Heard It In a Love Song,” “Fire On the Mountain,” “Can’t You See,” and “Take the Highway,” The Marshall Tucker Band earned seven gold and three platinum albums while they were on the Capricorn Records label. During the 90s, the MTB scored four hit singles on Billboard’s country chart and one on Billboard’s gospel chart. Their music has also been featured on the soundtracks of movies such as Smokey and the Bandit, Blow, The Pursuit of D.B. Cooper, Shipwrecked, Crank 2, Don’t Mess with Zohan, Stop Loss, Swing Vote, Taking Chances, and many others, as well as many TV shows. 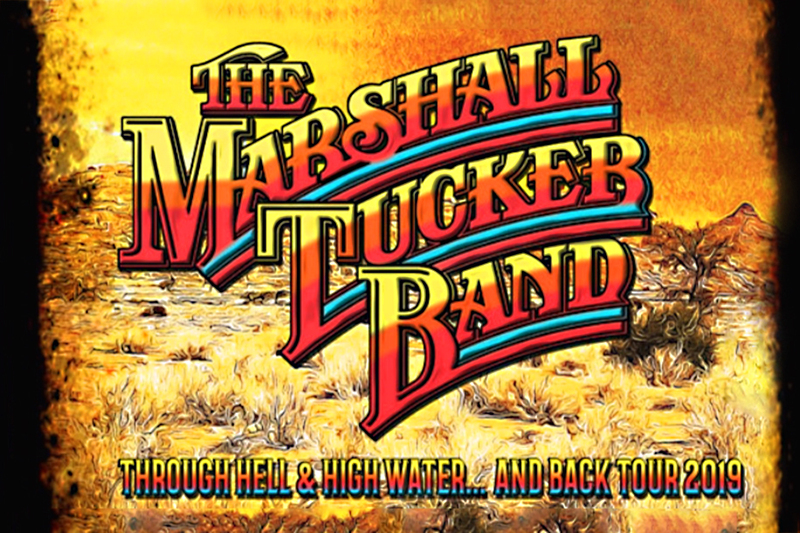 More than 40 years after forming, The Marshall Tucker Band continues to be played on classic rock and country radio, and they continue to tour, performing more than 130 live dates each year. UltimateClassicRock.com named the MTB’s “Can’t You See” the no. 1 Greatest Southern Rock Song, and CMT named it no. 4 in the same category. Their debut album, The Marshall Tucker Band, reigns as Gibson Guitar’s no. 5 Greatest Southern Rock Album. In 2013, GRAMMY Magazine named the group’s logo as one of the most distinctive and iconic brands in music.